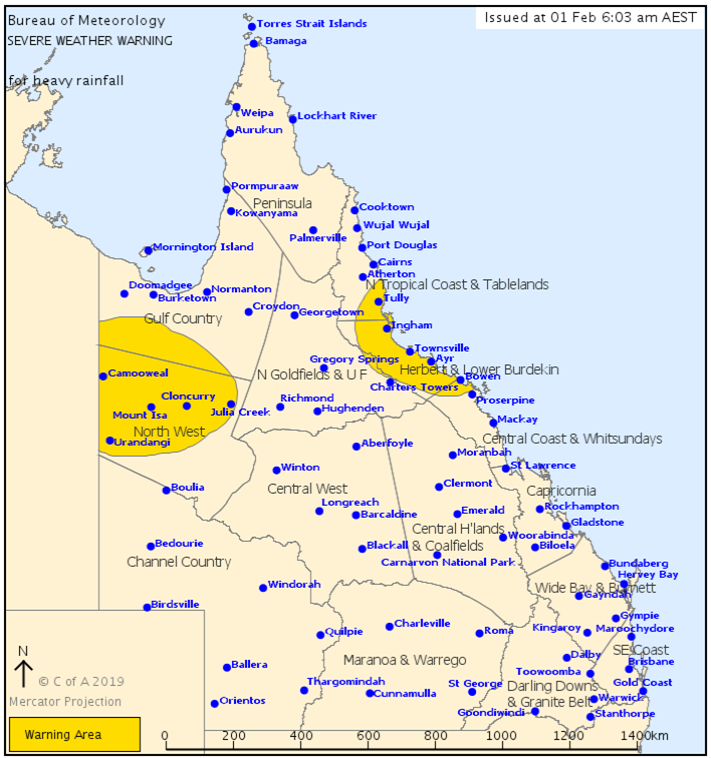 Tropical low has deepened, with heavy rain around the system (northwest Queensland). Flash flooding remains a significant risk. 1 in 100 year rainfall rates have occurred. Further 1 in 100 year rainfall possible, especially over the weekend near Townsville. 700 to 1000mm has been recorded in the last 3-5 days, with further falls of 1-2m possible around Townsville and the Herbert and Lower Burdekin district in the next 7 days. Townsville annual average rainfall is ~1100mm. Possible record heights on the Ross River, through Townsville area today. Major for the Ross and BohleRivers (around Townsville). The monsoon trough is expected to remain slow-moving across north Queensland for several days. Bands of heavy rainfall and thunderstorms are likely on the eastern tropical coast between Innisfail and Bowen. Six hourly totals of 150-200mm are considered likely. Heavy rainfall due to tropical low through northwest, with 75 to 125mm possible over 6-hourly periods.